Content marketers are taking it to the streets - and to stadiums, subways, and bus stops. With the vast majority of marketers using content to build their brands, it’s no wonder marketers are expanding the ways their content gets delivered. Experiential marketing is nothing new -- from billboards to sandwich boards, brands have a history of engaging consumers outside their homes. In recent years, however, out-of-home media spend has been among the fastest-growing categories - global spend is expected to exceed $40 billionn by 2018, according to PWC. The large canvas, the emergence of digitally powered signage, and the hyper-local nature of outdoor advertising have all contributed to the growth. Still, while the format may be known, today’s top marketers are innovating they way they use experiential marketing to tell their brand stories. Like all digital campaigns, the best ones move seamlessly across screens, formats, and platforms. When Qualcomm took over this bus stop for its “Born Mobile” campaign, the brand interwove print, mobile, and out-of-home to give unwitting bus takers the ride of their lives. The experience was very share-worthy: this video compilation of the stunt has racked up more than 3.7M views. Over the years, most experiential content marketing campaigns aims for 1:1 connections, hoping each user touched by the brand will share the experience with others through social media or through good old-fashioned word of mouth - which is what makes this Duracell campaign so noteworthy. In this Canadian campaign, Duracell shows the power of human connection, literally: this bus stop heats up only when those inside hold hands. “In Canada, we have cold winters,” the campaign says. “But we also have each other.” By involving users in the story and the experience, Duracell creates an experience that scales, one group at a time, and an image that’s worth sharing with the masses. Experiential content marketing doesn’t need to be high-tech to have a big impact. Bogota’s Ministry of Defense and ad agency Lowe won a Gold Lion at this year’s Cannes Festival of Arts and Ideas for this moving campaign, which urged Columbian guerilla fighters to return home to their families. 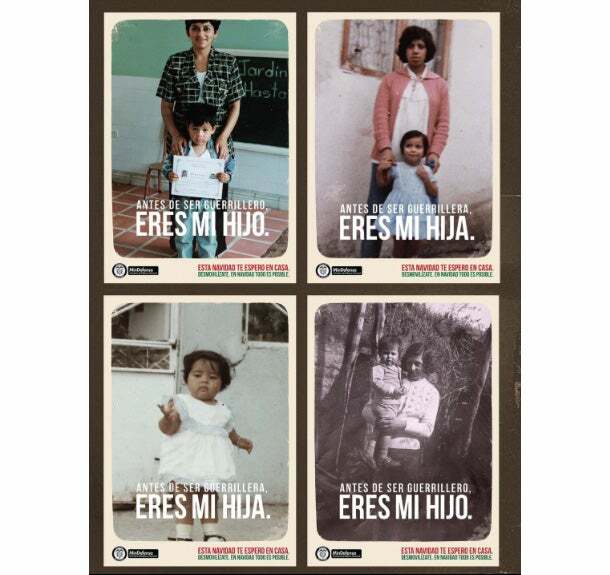 The campaign crowdsourced the visual content that was the centerpiece of the campaign - real photos submitted by the mothers of guerilla fighters, along with the simple phrase, “Before being a guerilla, you are my son.” By using childhood photos, the campaign ensured the guerillas’ safety, since only they would be able to recognize themselves in the photos. The personal images were affecting - viewed en masse, they are arresting. Help viewers learn and do. At Visually, we’ve seen firsthand that the most-shared content is often useful, informative, or helps the viewer in some way. By combining the physical with the digital, online retailer Peapod took visualization to a new extreme. Peapod created virtual grocery store aisles within subway stations, letting consumers use their smartphones to scan and order the items seen in the large format displays. The experience saved consumers time - and raised brand awareness for the retailer. Surprise & delight by rewarding your fans. From Jay-Z’s Decoded scavenger hunt to secret menu items at In-N-Out Burger, consumers love to be rewarded for their curiosity and loyalty. Content marketing lets brands deliver different layers of messaging to different sets of users. Out in the wild, even the simplest visual content can prove the most provocative and buzz worthy. Take this billboard, for example, which seems innocent enough. It advertises a lawyer named James M. McGill, along with a phone number to call him. But this is no ordinary lawyer - it’s Breaking Bad’s Saul Goodman, under a different name, in the town where Breaking Bad spinoff Better Call Saul is filming. When you call the number, as Breaking Bad fans (myself included) did, actor Bob Odenkirk’s recording says, ““Hello, you’ve reached the law office ofJames M McGill esquire, a lawyer you can trust.” Brilliant. On the other end of the technology spectrum, virtual reality and augmented reality are turning content marketing into a 360-degree, fully immersive storytelling medium. For the World Cup, Coke created a virtual reality experience in which users could move through a Brazil’s Maracana Stadium locker room, go onto the pitch, and play on the field - all via the Facebook-owned Oculus Rift headset. “This is a completely new platform for art, gaming, storytelling and communication,” Chris Milk, a filmmaker and music-video director, told Ad Age. Who said you can’t teach an old format new tricks?